How many god dam ferns do we honestly need to name after this women!? There's no way in hell GAGA in a DNA sequence is this unique to these ferns. While researching plants for the book I've come across a lot of really cool native plants that are very much outside the norm of what's sold at native plant nurseries. (I get tired of constantly seeing the same plants year after year and frankly I wish they'd sell more than just the same 3 species of milkweed, to give you an idea of what I mean by norm). Red Flowering Raspberry, Rubus odoratus, has gorgeous 2" flowers that come in a narrow range of purples pinks and reds. The fruit I read is either just as tasty or slightly less than the normal raspberries sold in stores. It's not often sold but I was able to find a few places selling it. 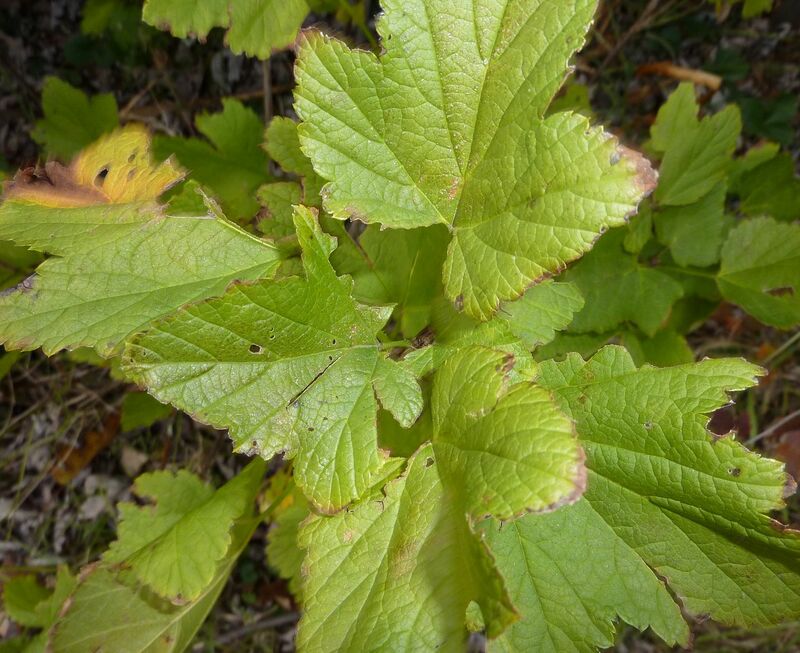 Cloudberry, Rubus chamaemorus, is a low growing alpine raspberry. This image doesn't do it justice compared to other google search images. They're low growing and are reminiscent of a strawberry patch. The fruit is said to taste a little starchy (lacking somewhat in flavor), but I just think the novelty of a dwarf yellow raspberry is neat. There are actual yellow fruiting raspberries that are probably better worth you time but this was an oddity I thought worth mentioning. Alpine Aster, Aster alpinus, is a true aster that flowers in May! As far as I can tell this is the ONLY aster species native to North America that wasn't move out of the true Aster genus. And oddly enough this plant grows more like a spring bulb than a perennial you'd expect sold at a nursery. 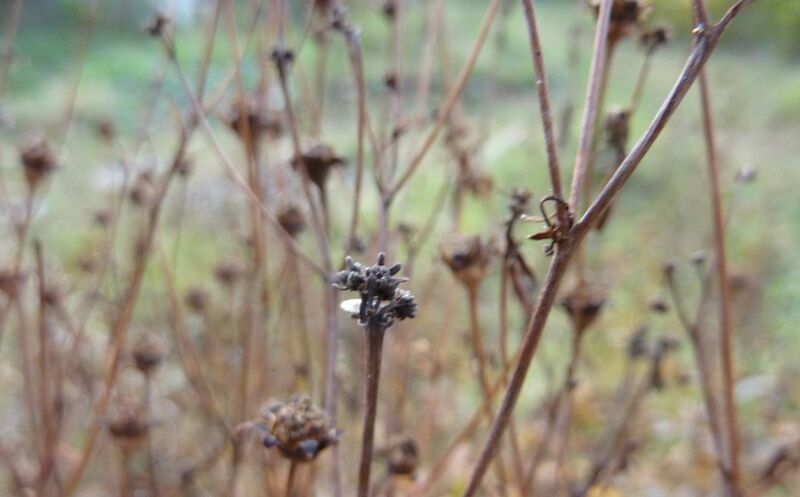 They emerge each spring and flower before going dormant sometime over the summer. It's a really bizarre growth habit for the genus... though I guess maybe it isn't. What are other true Asters like around the world? Seeds are available for sale but no one seems to sell the full plants. I'm tempted to buy some and give them a shot. Being an alpine plant I wonder if anyone can really grow them that far south of Canada. There is a patch of them in the rocky mountains though so maybe an ideal addition to a rock garden. Check them out on Google too! Not to be out done, there's also the Climbing Aster, Symphyotrichum carolinianum, (which some people have labeled as Ampelaster carolinianus, not sure who's right but it looks like a Symphyotrichum to me. Maybe the climbing aspect is why its in a different genus but I still think Symphyotrichum is right). As the common name implies, this is a vine the rambles all over and grows into a massive 6' - 10' long clump of flowers. They seem to bloom unusually late in the year too, and prefer growing in wet sunny conditions. I believe this is one plant that shouldn't be cut all the way to the ground but rather trained up a fence or trellis and cut back as needed. So those are a few of the neat plants I found and I hope to add more later on. Any who, I've never been a huge fan of fall color though some of the brilliant yellow and brilliant red trees have impressed me. These scenes are few and far between though and only last a few days before they're gone. What's happening here is that insects can't see red as well as other colors. The plants are purposely producing this pigment to discourage aphids from laying eggs around them. In this way they won't be the first trees infested with them come spring. How effective this is is debatable though especially with yellow being such a common fall color. 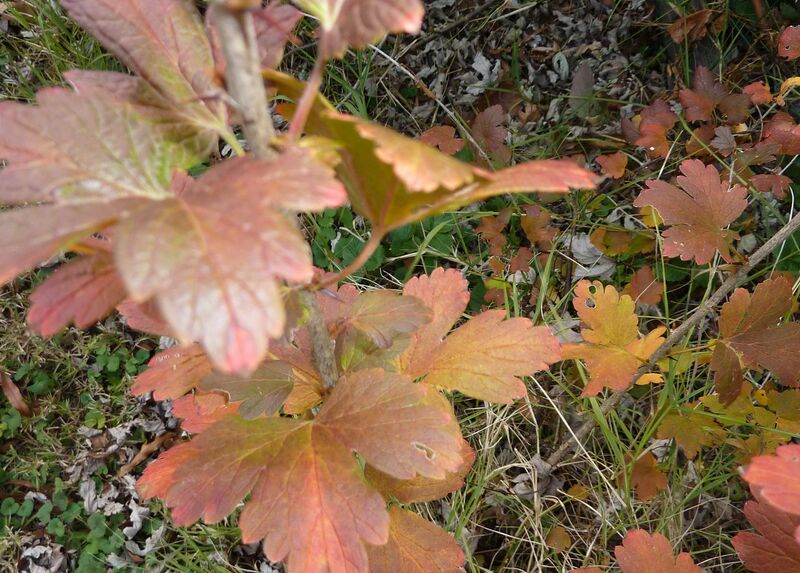 Our Gooseberry plants seem to be all over the place with colors. 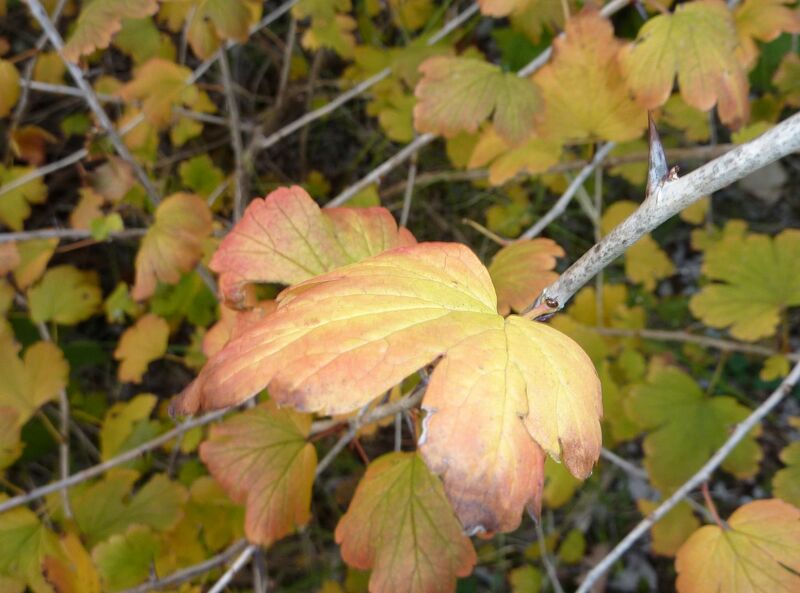 Fall color varies from cultivar to cultivar, species to species, and plant to plant as with the flavor of the berries. Some species growing in the same field can vary dramatically. It makes me wonder if any of the vendors selling Gooseberry/Current in the US knows what they're doing. From the same nursery this was sold as Red Gooseberry. 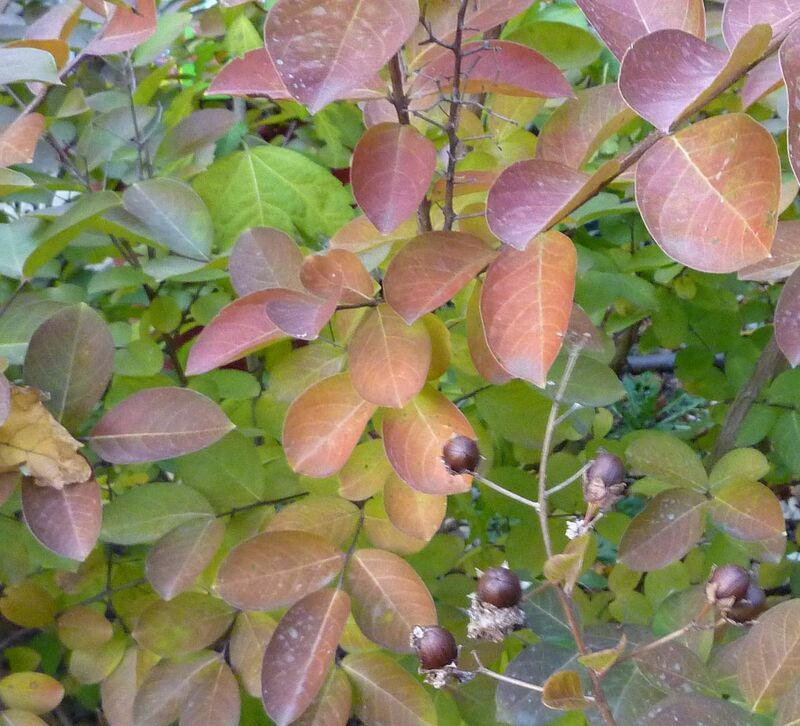 And so was this, but it has a different fall color, different branching habit, the leaves are slightly larger, and even the thorns were different. Next year I'll see about getting these identified to species level. Crape Myrtles seem to sport every color in the rainbow. Here I found the blurry view of our lawn through the stems of the Tall Tickseed to be an interesting composition. The nut-like seeds to our Buttonbush. It's nice to see some of these developed from all the attention the bees gave it this year. 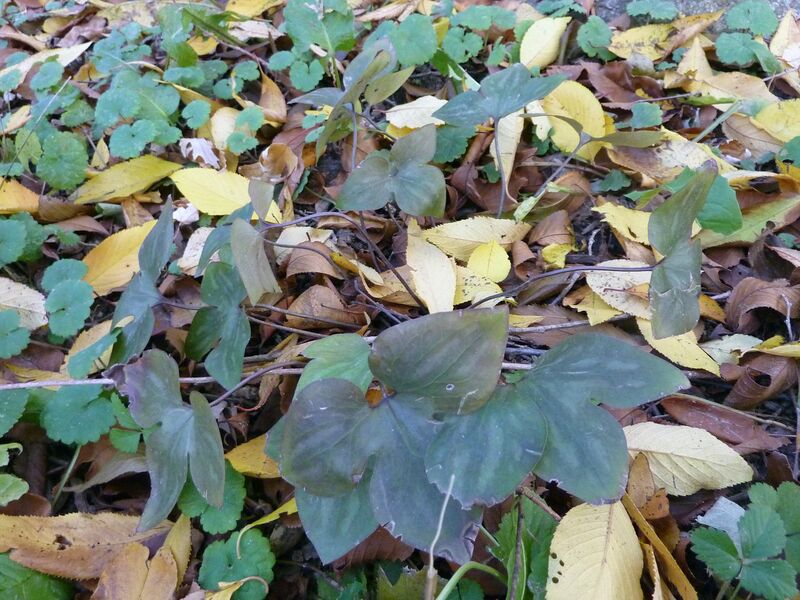 Mixed among the leaf litter is a couple of my Hepatica plants, which are semi-evergreen. 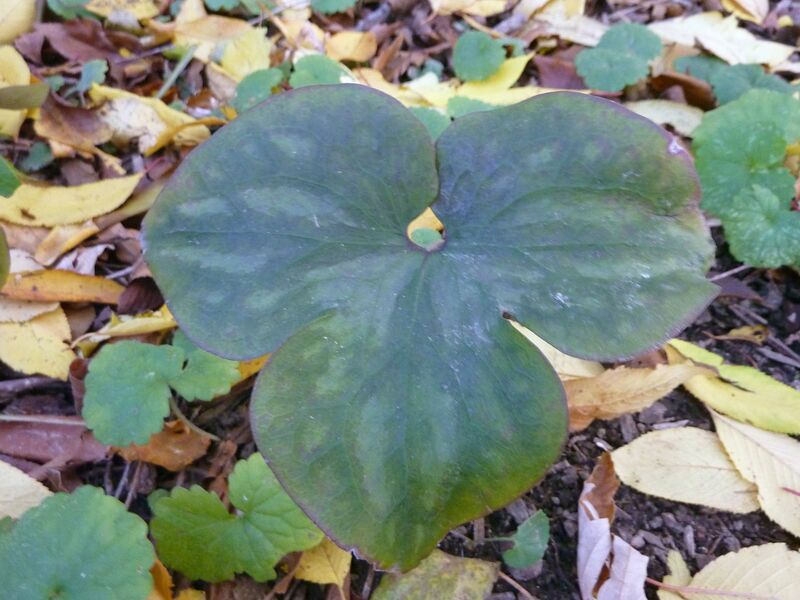 Hepatica leaves last the winter and finally die off right when it flowers in the spring. New leaves are produced just as the old ones have all broken off. 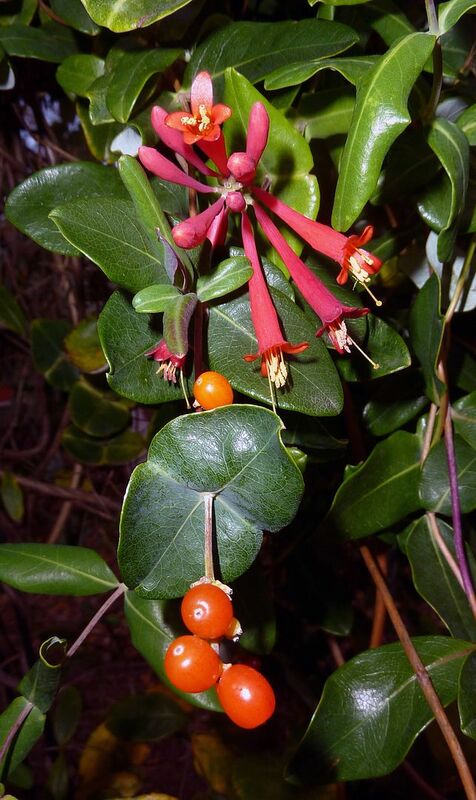 Coral Honeysuckle, does not care that its winter or not. I've always been impressed by how cold tolerant this plant is. Barely any of the leaves have started turning yellow and it still has unopened flower buds to go! I swear this vine must drop its leaves for only two months of the year, and each spring it makes up for lost time by quadrupling the number of flowers it produced all last year. 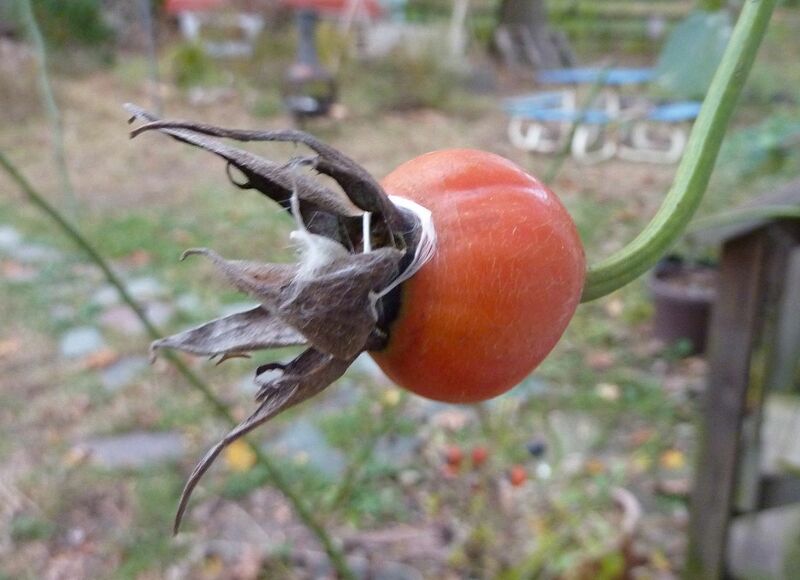 It's never been a heavy fruiting plant but there's always a berry or two where the flowers used to be. Rose hips are another fruit showing off right now. I'm told these are edible, but honestly I wouldn't know what to do with them. I'm still alive. Between Hurricane Sandy, The rescheduling of Halloween, The Election, Writing a Book, and the weather we got last night, I've been a too busy to take pictures and blog about things. Hurricane Sandy didn't really effect me or my yard at all. Power went out for about 5 minutes but quickly shot back on. Neighboring towns weren't as lucky and were out of power for at least 12 to 24 hours. My bother who lives one town over was included in the blackout. Thankfully I was storing a Christmas gift for my dad at his house that came in handy. Some Type of Hand Crank Lantern Gizmo that Charges Cell Phones. My dad doesn't read my blog, so I don't mind telling you I bought it for $10 on clearance. My brother tells me this thing works great. I'm at a loss to recall which one I bought exactly but hand crank charger for lights and electronics such as cell phones sounds perfect. Halloween got moved, several times. The paper said it was Friday in my town, Saturday in my brothers, and then Governor Christie got on TV and said it was Monday. Everyone went with the Monday thing making this probably the first time everyone in the state of New Jersey listened to anything he had to say. (I actually have a new found respect for him now that I see him praising Obama). So Halloween 2 finally happened earlier this week. We got about 30 trick or treaters at our door. My brother though, apparently a bus of Juvenal Delinquents showed up to his town and a group of 60 kids all showed up all at once. He was the only one home and almost out of candy so he called me up to buy some more. "Sure" I said, I'd be happy to. So I drove out to Rite Aid... apparently they didn't get the memo that Halloween was moved becuase there was nothing but Christmas Candy when you walked inside. So I went back to the junk food isle and came up with a huge grab bag of Reeses Pieces and Kit Kats. We watched Ratatouille and noticed... no one was coming to his door. Apparently after I showed up he didn't get another kid. In my research for the book I've found several plants that I want to get next year. I'll be blogging about what they are going over best of photos as I always do at this time of the year.